LAKE PLACID, N.Y. – On Saturday, Sept. 27, the Lake Placid Olympic Museum, located in the Olympic Center, on Main Street, Lake Placid, N.Y., will open its doors free of charge, as part of Smithsonian magazine’s 10th annual Museum Day Live! A nationwide event, Museum Day Live! offers free admission to visitors presenting a Museum Day Live! ticket at a participating museum or cultural institution. This event gives museums across all 50 states the opportunity to emulate the admission policy of the Smithsonian museums in Washington D.C. Last year’s event drew over 400,000 participants and this year’s event expects record-high participation. Also, available for viewing at the Lake Placid Olympic Museum, on the Sept. 27, is a new temporary exhibit, entitled the Olympic Prison. The Olympic Prison is a look inside the Olympic Village used during the 1980 Winter Olympic Games. Also known as the Athlete’s Village, the complex was built with the forethought that it would be converted into a federal correctional facility after the Games. Once the temporary home for the finest athletes in the world, it now houses federal inmates from around the country as Federal Correctional Institution Ray Brook, N.Y. Museum visitors can view building layouts, athlete photographs and have their mug shot taken. The Museum Day Live! ticket will be available to download at Smithsonian.com/museumdaylive. Visitors who present the Museum Day Live! ticket will gain free entrance for two at participating venues for one day only. One ticket is permitted per household, per email address. For more information about Museum Day Live! 2014 and a list of participating museums and cultural institutions, please visit: Smithsonian.com/museumday/venues. The Lake Placid Olympic Museum is located at the Olympic Center in Lake Placid, New York. It is open daily from 10 a.m. to 5 p.m. For more information, call 518-302-5326. -Richard Williams, the coach who guided Mississippi State to the Final Four in 1996. The United States of Golf Association (USGA) promotes and conserves the true spirit of the game of golf as embodied in its ancient and honorable traditions. It acts in the best interests of the game for the continued enjoyment of those who love and play it. The USGA serves the game most visibly through the conduct of America’s national championships, including the U.S. Open, U.S. Women’s Open, U.S. Senior Open and 10 amateur championships. Together with The R&A, the Association provides governance for the game worldwide, jointly administering the Rules of Golf, establishing equipment standards, and formulating the Rules of Amateur Status. The Association also maintains the USGA Handicap and Course Rating Systems, develops and promotes sustainable golf course management practices, and celebrates the history of the game. The USGA’s Library, an integral part of the USGA Museum’s function, is one of the premier sports archives in the world. In addition to being a central repository for documents that chronicle the history of the game, the Library serves as a resource to USGA staff, media, writers, filmmakers, researchers and scholars, avid golfers, USGA Member Clubs, allied associations and many others around the globe. There are more than 76,000 items catalogued in the Library’s archives with an annual growth rate of approximately 10%. Included in these collections are books, periodicals, letters, documents and personal papers of writers, golfers, allied institutions and significant figures in the sport, as well as USGA institutional historical records. This position is a once-in-a-lifetime opportunity for an experienced hands-on library professional to oversee one of the world’s premier sports libraries. The Special Collections Librarian will work with the Museum Director to develop, supervise and execute the tactical plans that will to ensure the USGA’s Library remains the leading golf research center in the world. The Librarian will use best archival practices to process the collections; support researchers; catalog books, periodicals, and other written materials on a day-to-day basis; identify materials needing repair and conservation; ensure use of proper preservation techniques; help prepare information and collections for USGA content; and perform any other function necessary to the Library’s operation. This will include developing, documenting, prioritizing and administering procedures, policies and guidelines for the use of materials in the Library. The Special Collections Librarian will also maintain a database of all archived material within the Library and propose changes and updates as appropriate to the existing system. This position will have formal training and an understanding of current best-practices in Library Science and knowledge of digital technologies and resources. 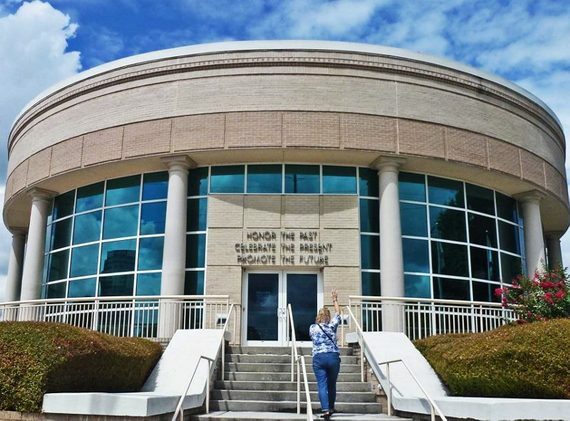 The successful candidate will be knowledgeable about the acquisition and preservation of digital records and will be asked to develop and implement a comprehensive digital collections plan for the Library. Determines the research value of documents or library materials offered to the Library (in collaboration with the Director, Assistant Director and Senior Curator/Historian) and assesses donation of materials that fits the mission of the USGA Library as defined by the collections development plan. Master’s degree in Library Science, Archival Management or related field is required. South Williamsport, Pa. (August 14, 2014) – Nationally-celebrated pop artist Charles Fazzino, has created officially licensed works of art for 14 NFL Super Bowls, 11 MLB All-Star Games, and many other major sporting and cultural events. His creation – in celebration of the 75th Anniversary of Little League® was unveiled at the World of Little League: Peter J. McGovern Museum and Official Store Viewing Plaza on Saturday, Aug. 16. The artwork was installed and is on permanent display at the World of Little League in the World Series Gallery presented by Easton Foundations. Through the support of the First Community Foundation Partnership of Pennsylvania (FCFP), Mr. Fazzino held a series of educational workshops for students and teachers from Lycoming and Sullivan County school districts in Pennsylvania to work on the official artwork for the 75th Anniversary of Little League in February 2014. The visit also kicked off the work of fifth grade classes in Lycoming and Sullivan Counties to create their own Pop Art Project, and an art contest for the high school students in the same school districts. The artwork created this past school year is currently on display with Mr. Fazzino’s work for the exhibit Collective Pop at The Gallery at Penn College on the campus of the Pennsylvania College of Technology. The exhibit was on display through Aug. 24, with a special “Meet the Artist Reception” on Monday, Aug. 18. Mr. Fazzino also participated in the ceremonial first pitch prior to the Aug. 16, 7 p.m. Little League Baseball World Series game at Lamade Stadium with the fifth graders who helped him construct the Official Artwork of the 75th Anniversary of Little League. Mr. Fazzino signed commemorative posters on Saturday, Aug. 16 and Sunday Aug. 17 from 1-2 p.m. in the World of Little League Official Store and from 4-5 p.m. in the Stadium Store. Little League® Baseball and Softball is the world’s largest organized youth sports program, with 2.4 million players and one million adult volunteers in every U.S. state and more than 80 other countries. In 2014, Little League is celebrating its 75th Anniversary of developing major league people. For more information, visit LittleLeague.org, or follow the Little League on Facebook (facebook.com/LittleLeague) or Twitter (twitter.com/LittleLeague). Celebrate Little League’s 75th Anniversary online at LittleLeagueBigLegacy.com, official hashtag: #LittleLeague75. Follow all of the action from the nine Little League World Series at llbws.org or on Facebook and Twitter at hashtag: #LLWS. SOUTH WILLIAMSPORT, Pa. (August 8, 2014) – Joining Little League® at the age of eight and playing until he was 15, Mike Mussina pitched his first game ever for the Johnny Z’s Restaurant team in the Montoursville (Pa.) Little League (MLL) at the age of 10. From that fateful day, he embarked on a baseball career that took him from the blue and gold of the Montoursville High School Warriors, to the Cardinal Red of Stanford University, to Major League Baseball with the Baltimore Orioles and New York Yankees. At the 68th Little League Baseball® World Series in Williamsport, Little League’s celebration of its 75th Anniversary will commence as Mr. Mussina’s accomplishments on and off the baseball field will be recognized when he is enshrined in the World of Little League: Peter J. McGovern Little League Museum’s Hall of Excellence. The enshrinement ceremony is set to be held before the World Championship game, scheduled for 3:30 p.m. on Sunday, Aug. 24. Mr. Mussina will be the 48th person to be enshrined in the Little League Hall of Excellence. While his career took him to the highest level of baseball, Little League has always been near to Mr. Mussina’s heart. In 2001, he was elected to the Little League International Board of Directors. His is in his sixth year as a Little League coach and his 17th as an MLL volunteer Board member. Consistency, tenacity and durability were staples of Mr. Mussina’s MLB career. As a member of the Little League International Board of Directors, his experience and unique insight have been valuable to discussions at the highest levels of the organization. Among the decisions made during his tenure on the Board was the significant shift in Little League rules governing pitcher eligibility. The conversion to the Little League Baseball Pitch Count and development of the regulations came with Mr. Mussina’s direct input, along with fellow Little League Board of Directors member, and premier expert on sports injuries, Dr. James Andrews and his colleague, Dr. Glenn Fleisig. Since 2007, when the regulations were implemented, Mr. Mussina has had the opportunity to experience the positive impact first-hand, both as a coach and parent. Retiring from the Yankees in 2008, Mr. Mussina, then 39, hung up his uniform after posting a 20-win season (20-8). For his career with the Orioles and Yankees, he won at least 11 games in 17 consecutive seasons (an American League record) and recorded a career .638 winning percentage. Among pitchers, he ranks 33rd in all-time wins (270), 33rd in games started (535), 66th in innings pitched (3,562.2), and 19th in strikeouts (2,813). A five-time All-Star and seven-time Gold Glove winner, Mike’s consistency resulted in six top-five finishes in the voting for the American League’s Cy Young Award. Mr. Mussina graduated from Stanford University in 1991 with a degree in economics, while competing for the Cardinal baseball team. Established in 1988, enshrinement in the World of Little League Hall of Excellence is an annual honor bestowed on a Little League graduate (or graduates) who have demonstrated a commitment to excellence in their chosen profession and exemplify the values learned as children in Little League Baseball or Softball. For more information and a complete list of Hall of Excellence enshrinees, visit LittleLeagueMuseum.org. The Georgia Sports Hall of Fame’s newest exhibit, We are the Champions: Georgia’s College Football National Championship Teams, is now on display in the museum’s rotunda. From Georgia Tech’s 1917 National Championship team to Valdosta State’s Division II national title in 2012, the exhibit highlights the handful of college football teams from Georgia that have been declared the best in the country. Along with jerseys, helmets, footballs, and photographs from the University of Georgia, Georgia Southern, and the University of West Georgia, the exhibit features many unique artifacts such as Georgia Tech’s 1917 National Championship trophy, a 1985 Georgia Southern National Championship ring, and a 1943 Rose Bowl program from the University of Georgia. We are the Champions: Georgia’s College Football National Championship Teams will remain on display through December. Visitors were able to view him and his Kentucky Derby trophy in the ProRodeo Hall of Fame Zoetis Barn and take photos. Admission was by regular museum admission price. There were special screenings of the film “50-1” at the First & Main Town Center Cinemark, 3305 Cinema Point at 7 p.m. on both Wednesday and Thursday. Wednesday was the VIP reception with admission to the film, food from the Wobbly Olive and a photo opportunity with Mine That Bird for $40. The $10 movie-only package on Thursday included admission, a voucher for one small popcorn and a small soda, along with a chance to see Mine That Bird. Both programs benefited the USAFA Equestrian Center Warrior Wellness Program, which recognizes the healing qualities of horses. Service members from all branches can participate in the program as a way to cope with their mental and physical injuries, especially those that are combat-related. Mine That Bird capped his Pikes Peak area visit on Saturday, Aug. 30 with an appearance at the Air Force Academy’s season-opening football game with Nichols State. The Baseball Hall of Fame in Cooperstown, New York is a popular vacation destination but there are many sports represented around the country that are worth a trip too. Some may dispute whether or not pinball is a true sport but since I spent so many hours of my misspent youth hanging around in bowling alleys I’m including it. Besides, there are competitive tournaments and those flipper fingers can get mighty tired. 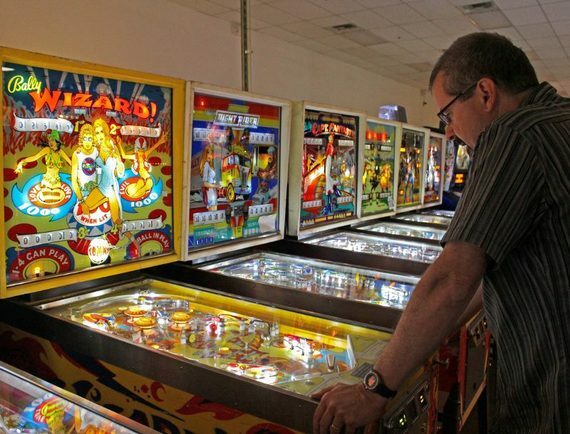 The Pinball Hall of Fame is unique because it honors the machines, not the players. Aficionado Tim Arnold has over 250 vintage pinball games on display and, best of all, they are ready for playing. Tip: To really stretch your playing time seek out the older machines where you still get five balls for 25 cents. 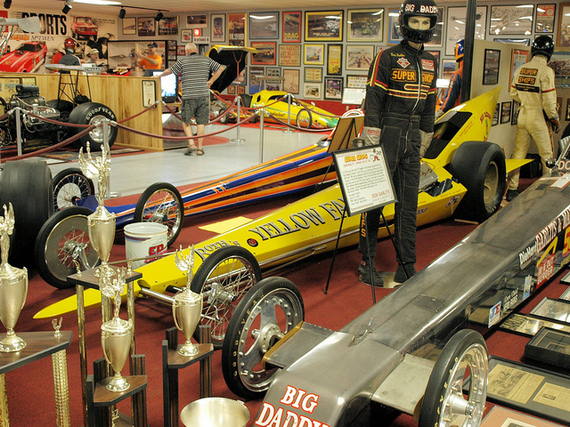 Attached to the Don Garlits Museum of Drag Racing, the hall of fame honors the heroes of drag racing. You’re really getting two museums here with over 300 vintage cars on view and “Big Daddy” Don Garlits’ personal collection. For an extra fee the “Father of Drag Racing” himself will take you on a personal tour that includes his private garage and autograph signing. How many halls of fame can offer that? The Rondy, or Fur Rendezvous, is an annual event in Anchorage that combines a World Championship sled dog race and (sort of) related activities including outhouse races, snowshoe softball and the traditional running of the reindeer down 4th Street; think the running of the bulls with furrier animals and snow. Despite all the merriment, the race itself, which is older than the famous Iditarod, is a serious event. 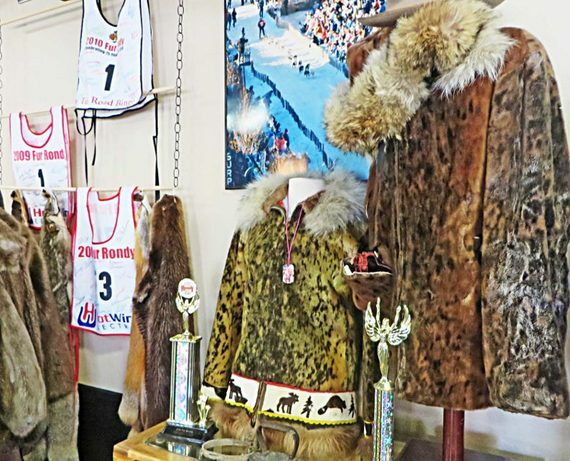 Past winners are enshrined in the Dog Mushing Hall of Fame in the back of Caffe D’Arte. You can even try on a musher’s fur coat and pose on a sled. 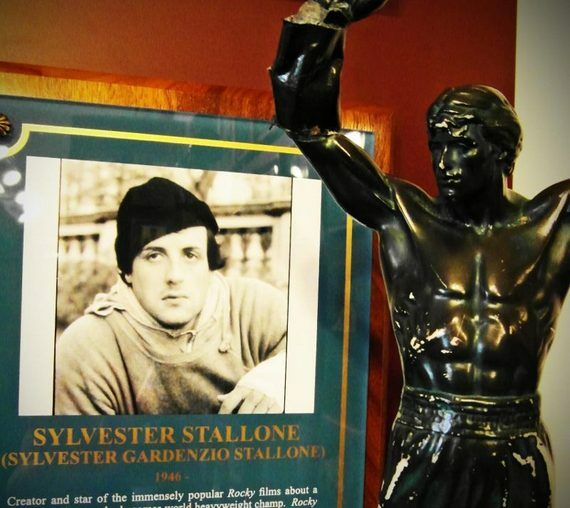 Since we’ve been traveling around the world for three years with a Rocky statue, we just had to visit this one; and were pleased to see that Sylvester Stallone has been inducted for his contributions to the sport. Considering how huge boxing was around the world in the mid-20th century, it’s hard to believe the sport didn’t have a proper Hall of Fame until 1989. It opened in the upstate New York hometown of former world champions Carmen Basilio and Billy Backus. The museum is conveniently located right off the New York Thruway and includes memorabilia from boxing’s Golden Age through today. The annual inductions ceremonies in early June bring out scores of well-known pugilists. We’ve visited the men’s Basketball Hall of Fame in Springfield, Massachusetts and the women’s in Knoxville and have to say the latter is much more interesting. (And not just because our Philadelphia hometown favorite Dawn Staley is an inductee.) You really get a sense of the history of how women’s basketball developed from its humble roots in 1892 when the women wore wool bloomers as uniforms to the sleek sport of today. Plus how could a true hoops fan not like a place which boasts the world’s largest basketball? Make sure to test your dribbling and shooting skills on the basketball courts. 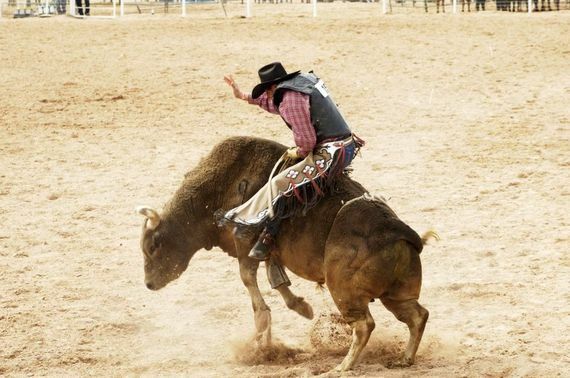 Pro rodeo riders may take the prize for the most bruises suffered in their sport. But it’s all worth it to win a silver belt buckle large enough to serve a full rack of ribs on. In the Hall of Champions, cowboys in each rodeo event are honored with plaques, memorabilia and cowboy-themed artwork. The Heritage Hall with its displays of saddles and equipment over the years is a must for rodeo fans. This free museum is one of the best presented we’ve seen anywhere. Even someone with only a passing interest in horses will be mesmerized by the displays highlighting the history of the sport. 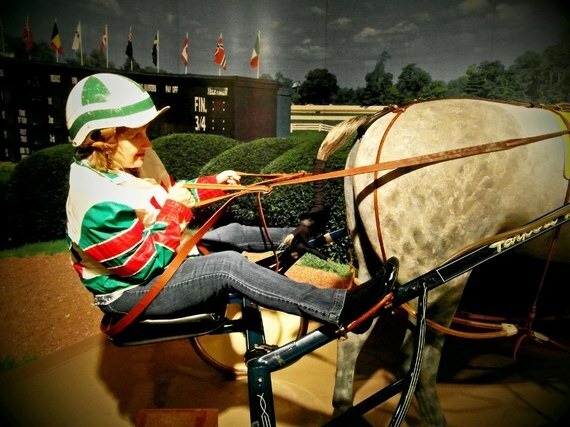 You can even don a set of racing silks and helmet and put yourself in the driver’s seat for a cool photo op behind the working end of a racing horse. (As Larissa demonstrates above.) The lifelike statues that are created to represent each honoree are truly outstanding. An active racetrack sits behind the museum where you can visit the stables and even meet a few of the horses. Despite its southern California beach vibe, volleyball was invented in 1895 by William Morgan in Holyoke, Massachusetts as a less physically demanding alternative to the new game of basketball. Once it took hold in Asia in the early 20th century it grew into the second most popular team sport in the world after soccer. The Volleyball Hall of Fame opened in 1987 and is one of the most international of all sports halls of fame with inductees from 21 countries. This quirky museum may not be an official hall of fame, but since they display the yo-yos used by the winners in the World Championships, I’m including it. 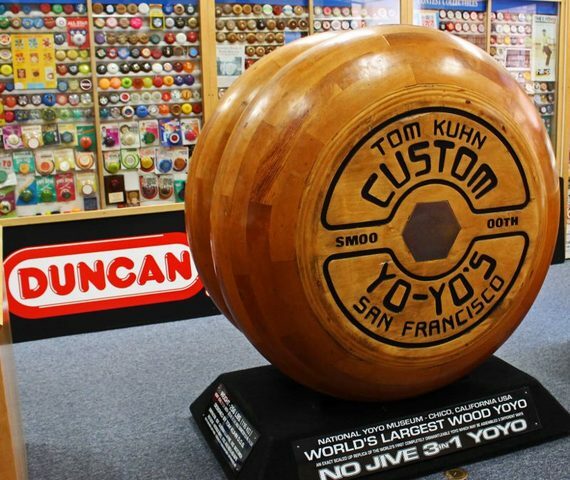 Besides, where else can you see the world’s largest working wooden yo-yo? They dangle it from a construction crane to play it. Come to Chico in October when they host the global tourney and be amazed what the competitors can do with a little round thing spinning on the end of a string. Note: Be careful parking in Chico and make sure you keep the meter fed. The meter maids are pretty aggressive. Who knew there was a National Jousting Association, that it’s the official sport of the state of Maryland, or that there’s even a Jousting Hall of Fame? 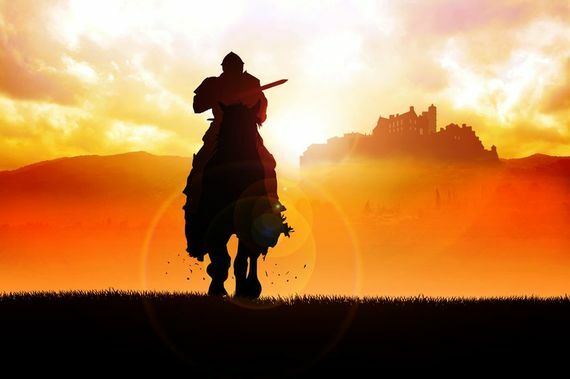 This is not a tribute to some long dead medieval knights but a museum dedicated to active jousters. It’s a bit less bloody these days as the competitors try to spear a ring hanging from a string rather than each other. The Hall of Fame is nestled in picturesque Natural Chimneys Regional Park. 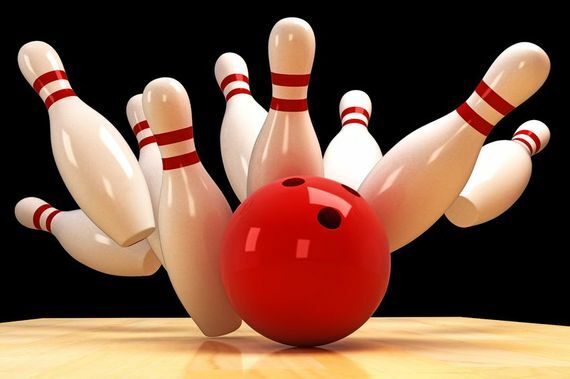 The good folks at the International Bowling Museum and Hall of Fame claim that bowling is becoming a worldwide phenomenon with participation by over 90 million people. I can believe it. When we were in Pyongyang, the capital of North Korea, we visited Golden Lanes which was mobbed with bowlers. Bowling dates back to ancient Egypt and the complete history is on display here. It will even interest people who don’t know the difference between a 7-10 split and a 7-11 store. If you’ve ever driven along Interstate 83 just north of York, Pennsylvania you can’t miss the 13-foot tall fiberglass statue of a man lifting a barbell over his head. 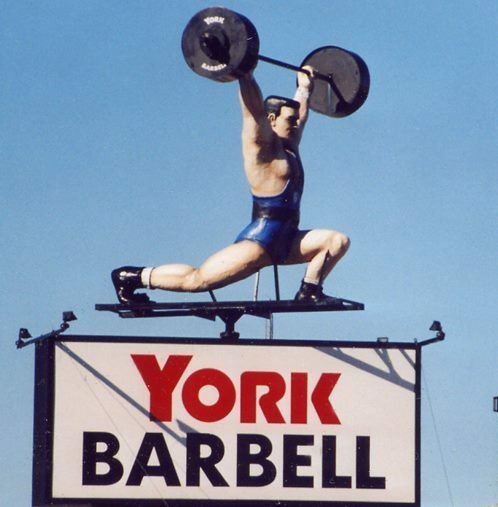 Referred to locally as “The Barbell Guy,” he’s hoisting that weight above the York Barbell Company (Arcane trivia: York is also the birthplace of the York Peppermint Pattie.) Inside the company headquarters an 8,000 square foot space has been set for the Hall of Fame. You’ll pass a larger-than-life statue of Bob Hoffman, known as the “Father of International Weightlifting,” he also founded the York Barbell Company. Exhibits inside the hall present the history of weightlifting and honor both male and female greats of the sport. What other sports halls-of-fame do you suggest visiting? In 2011 Philadelphia natives Larissa and Michael Milne quit their jobs, sold their house and gave away their possessions to travel around the world with a Rocky statue and have been on the road ever since. You can follow the journey and pick up valuable travel tips on their award-winning travel blog at Changes in Longitude.